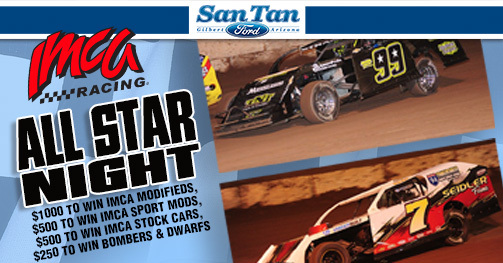 Saturday night March 16 the top teams of the IMCA Modified division all have a shot at $1000 and Fast Shafts All Star qualifying. 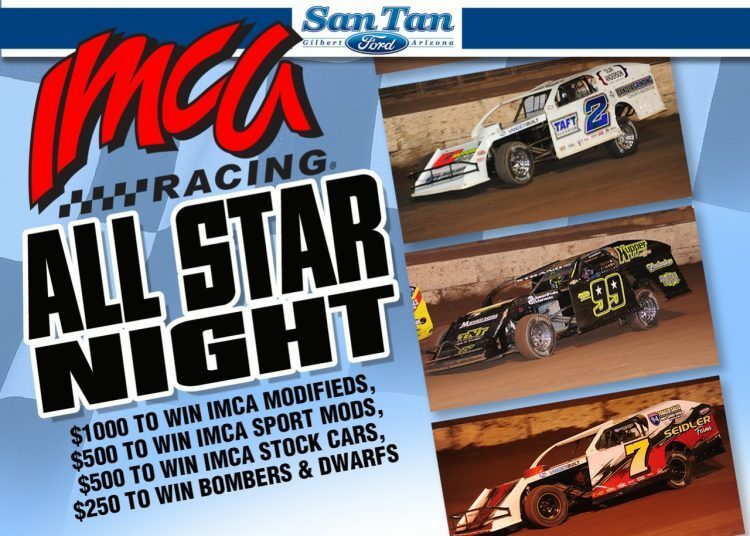 IMCA Sport Mods and IMCA Stock Cars both challenge for $500 to win along with Robert Horne Ford Bombers and Dwarf Cars having a chance at a $250 pay day. Action begins at 7:00pm Saturday March 16 at Arizona Speedway with grandstands opening at 5:00pm and pits opening at 4:00pm. Cost for admission just $16 for adults, $14 Seniors. kids 11 and under are free. Pit passes $35 , kids 6-11 pit passes $10 and kids 5 and under free. Arizona Speedway is located within ET Motopark at 48700 N Ironwood Dr. San Tan Valley, AZ 85140 5 miles south of US60 on Ironwood dr. Call the hotline for more info. 480-926-6688 . Follow us at www.Facebook.com/ArizonaSpeedway .